Enterprises deploying cloud-native applications are ditching traditional infrastructure approaches. They realize that the need to order, connect, rack and stack dedicated hardware appliances for various network functions slow down application deployments and updates. 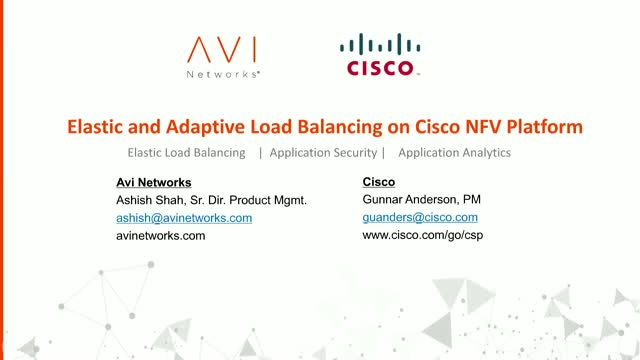 Cisco Systems and Avi Networks have teamed up to solve one the most common automation challenges in the application delivery cycle. Cisco CSP 2100 is a robust network function virtualization (NFV) platform and is part of Cisco Secure Agile Exchange solution. The Avi Vantage Platform delivers multi-cloud load balancing and adaptive per-app services using a scalable, software-defined architecture.